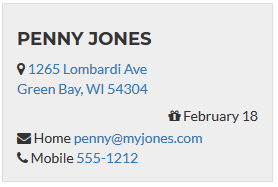 Because many people have multiple e-mail addresses, multiple phone numbers, and sometimes more than one address, Planning Center People allows you to enter all of those addresses. When a person has more than one of any of these, you can select a primary, and Planning Center will use the primary when only one is needed. Adjace works with these primary flags, here’s how. 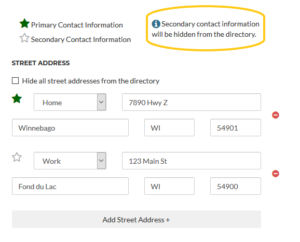 Adjace synchronizes all of this information, and allows you to determine whether your directory will display only the primary contact information, or include the secondary (non-primary) contact information. Hiding the secondary information can be useful – for example, when you have folks who need to have two e-mail addresses on file with you but only one should be shown in the directory. The setup for this option is a simple check box in the directory layout screen. 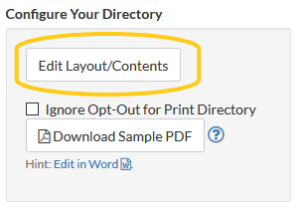 First, go into the directory layout editor. Here, you will see a check box to show secondary contact information. Change the value, and you will see a preview of the directory with or without the secondary contact information, as specified. 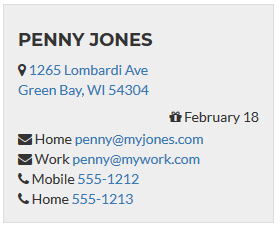 If your directory is hiding the secondary contact information, when your folks edit their profiles, they will see a note to inform them that only the primary contact information will be shown in the directory. And of course, if you have opt-out enabled for your contact information fields, your folks will be able to hide their primary contact information also.